After eleven days, four countries, and some 20,000 miles, Tawn and I touched down at Suvarnabhumi International Airport (thankfully, not at Don Mueang, which reopened Sunday to domestic traffic – funny controversy brewing here over the “best” Anglicisation of the Thai name “Mueang”) at about 10:15 Tuesday evening. Picking up where I left off in the last entry, on Saturday we had a combined birthday party for my niece Emily and my maternal grandmother. By this point most of our errands were run but I still had to go to the bank to deposit a few checks, so I asked Emily if she wanted to go with me and stop for hot chocolate on the way. So she and I stopped at Starbucks, enjoyed cocoa as I read some books to her. Emily had a friend’s birthday party to attend Saturday afternoon so by the time her party began she was already in a crabby mood. I find it fascinating to compare the personality of my two nieces, and to also compare their personalities as young children to the personalities of their parents at the same age. Emily is, without a doubt, proof of the principle of karma: her personality is a mirror of her mother’s at the same age and must be some sort of retribution for whatever aggravations she provided our parents. She often cuts off her nose to spite her face and seems to be obstinate just for the sake of being obstinate. Let me be clear, she’s a wonderful child and I leave her dearly despite the melt downs and moments of drama queen-ness. She does make things so much harder for herself than need be. After dinner – a pizza party where I made four different types of pizza from scratch including a pepperoni and black olive special order for Emily that elicited a refusal to eat it when she saw another pizza coming out of the oven with mushrooms on it – we went to the living room to open presents. For the past two years, pretty much as long as Emily has been able to talk, she has been fascinated with the jade that I wear around my neck. The whole time, she’s told me that she wants one but in yellow, her favorite color. So before this trip Tawn and I purchased a yellow jade pendant for her to wear. 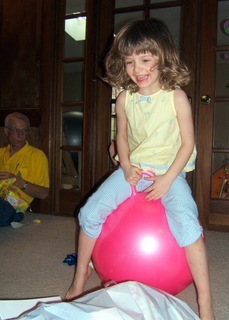 Even the morning of her party, she had admired my jade and reiterated that she wanted a yellow one. So I was a little surprised when, upon opening the jade and being told what it was, she was disinterested in it and literally tossed it aside. 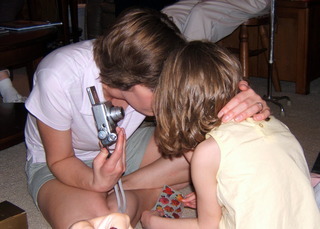 Before long, it was time for a special “mother-daughter conference” (above right) and Jennifer spelled out her expectations for her daughter’s behavior, under threat of present opening coming to a rapid conclusion. In true drama queen style, the sober mood immediately gave way to joy once a bouncy ball was unwrapped, proving to be the favorite gift of the evening, right. This gave way to more unhappiness a few minutes later around some other issue. Thankfully, we got the presents unwrapped with a minimum of tears and were able to move on to cake, a pineapple-coconut freezer cake that is one of grandmother’s specialties. If I had a larger refrigerator I’d make it hear as it is really an excellent, moist cake. Maybe once we buy a condo I can buy a full sized refrigerator. Now we couldn’t get a good picture with the first round of candle blowing-out, so I actually relit the candles so we could try a second time, producing this much better result. I think it is hilarious how Tawn is looking at the camera! Dinner ended early, by about 8:30. Between having grandparents and young children – plus being in the American midwest – dinner is an early phenomenon. Takes some getting used to as back in Khrungthep, Tawn and I rarely start dinner before eight. We spent a few hours finishing our packing, carefully balancing the heavy items so none of the four bags to be checked in would push the weight limits. This was challenging because much of the things we were bringing back were weighty: magazines, bulk nuts and dried fruit, and some cookware. Finally, I got to bed about 11, knowing that I’d have to wake up by 3:30 in order to get to the airport for our 6:00 am flight. As happens way too often, the first flight out of Kansas City was delayed. This time due to a mechanical problem on the regional jet, but there seems to frequently be an issue with the first flights: late arrival the night before of the crew, weather delays, flow control into Chicago, etc. Our 6:00 was canceled and we were rebooked on the 7:47, giving us a 10-minute connection time in Chicago. The agent rebooked us on the later connecting flight to Toronto, meaning that instead of arriving at 11:30 am we would arrive at 4:45 pm. Thankfully, we arrived in Chicago a few minutes early and our original Toronto flight was 20 minutes delayed. Since our bags were still tagged for the early flight, we were able to get on board and even with the delay arrived in Toronto by noon! Unfortunately, I didn’t make sure I had Alan’s mobile phone number with me. The only number I had was his home number and I already knew he’d be out and about. In the meantime, though, we met up with an airliners.net member with whom I’ve been conversing for a year or so, Kevin. This being Tawn’s first trip to Canada, we met up at Tim Hortons, the ubiquitous coffee and doughnut fast food chain that some consider iconically Canadian. In addition to having really good coffee and doughnuts, they have decent sandwiches, chili and soups. Not having success reaching Alan, we walked around the Bloor and Yonge area, one of the main shopping areas of downtown Toronto. Not appropriately dressed for the weather, we were a bit chilly and found our way indoors whenever we could. Thankfully, Alan made it home by 4:00 and we were just around the corner from his well-located house so walked over. 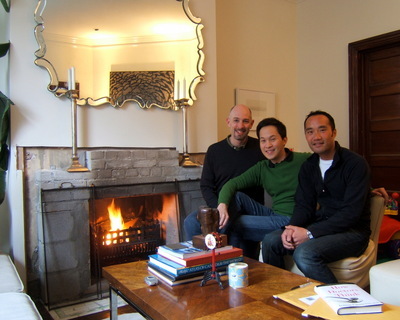 The cousin of my former roommate and high school friend Anita, Alan is the gay architect/designer brother Tawn and I never had. Alan’s brother, Patrick, and his wife Daniella just celebrated the first birthday of their daughter Nathalie, so we had a chance to see her for the first time. Unfortunately she was a bit under the weather so I didn’t get a picture. 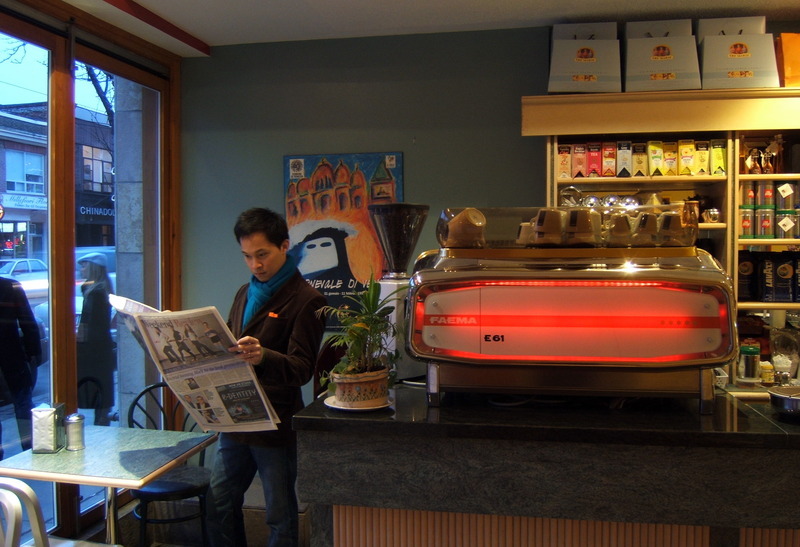 Below, Tawn stops at a bakery-cafe to read the paper. Above left: posing in Alan’s living room with the unfinished-yet-functional fireplace. 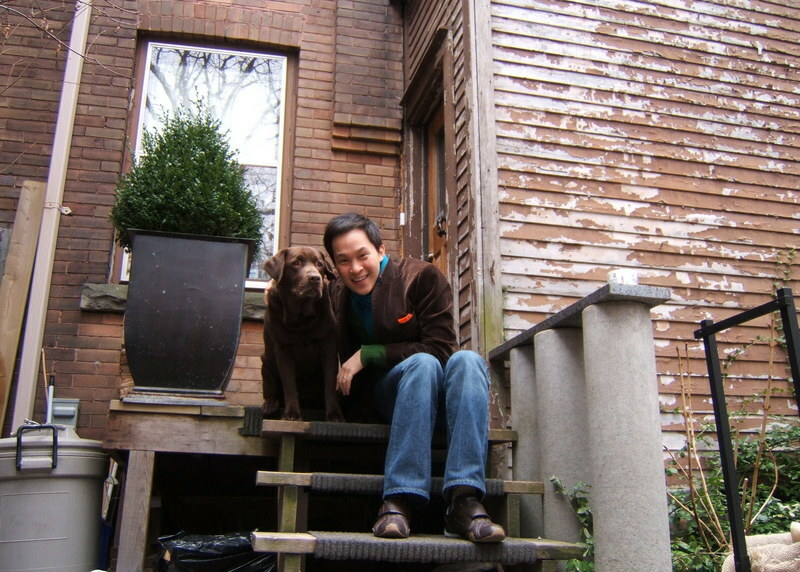 Above right: Themes in brown – Tawn and Dexter sit on the back porch. Below left: the Royal Ontario Museum nears completion of its angular, Daniel Libeskind-designed addition. 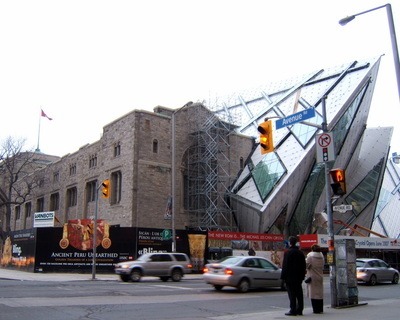 Libeskind designed the master plan for the World Trade Center’s reconstruction. 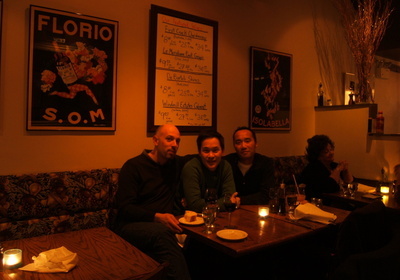 Below right: dinner at Bistro Tournesol on Dupont Street. Toronto has lots of fantastic little neighborhoods, lined with shops, restaurants, and theatres. Toronto and Melbourne remind me of each other in various ways. Below, despite it being a Sunday evening there were crowds outside the Royal Cinema on College Street for the 10th Cinefranco celebration of international francophone cinema. While only a few hours long, we really enjoyed catching up with Alan. Tawn decided that Toronto is on his list of places he would live in the future. Good on you, Canada. 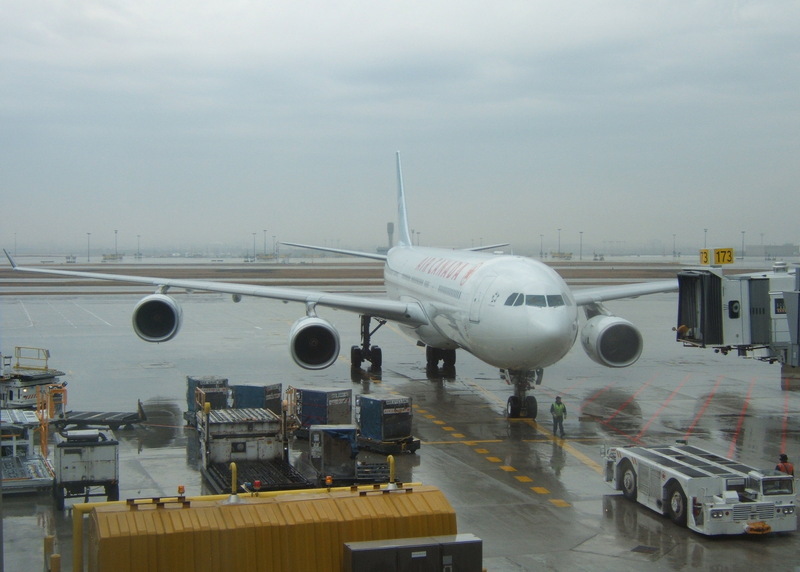 Monday morning we were out at Toronto’s Pearson International Airport for our nonstop flight to Hong Kong. The new airport terminal (number one) is a very nice facility with lots of space and light and a roof that suggests the wings of a bird. 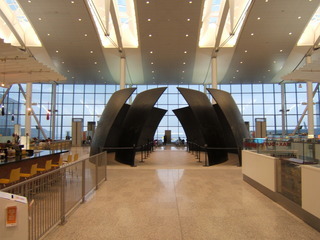 There is also a lot of public art, including the sculpture below. 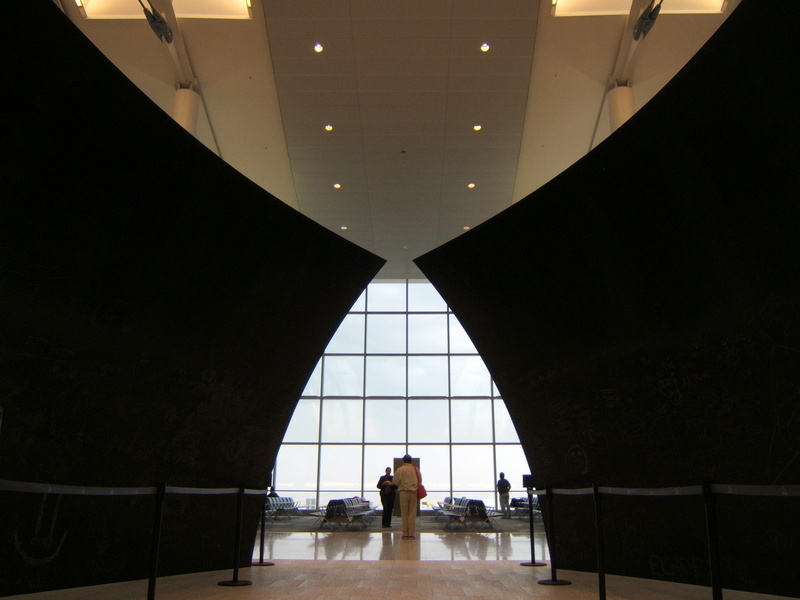 It is a dynamic piece titled Tilted Spheres by sculptor Richard Serra. 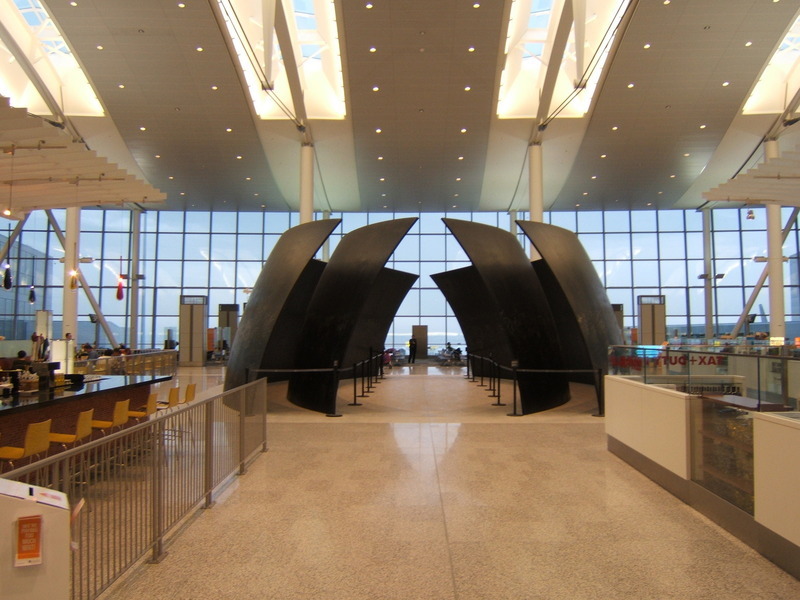 It is so large that it had to be installed first and then the terminal was literally built around it. 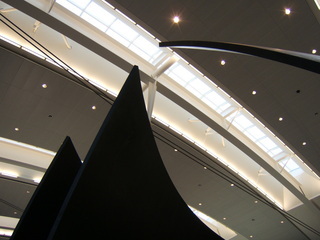 The link above shows a picture of the sculpture sitting forelornely amid beams in the early stages of construction of the terminal. More information on the artist is here. A detail that cannot be seen in these pictures is that the sheets of metal have been covered with graffiti by airport visitors. It wasn’t until I did some research that I discovered this article from two days ago in the Toronto Star that clarified that this graffiti was not intentionally part of the sculpture. I have to confess, I thought the graffiti was a part of the sculpture! Our flight to Hong Kong was aboard Air Canada’s flagship Airbus A340-500. This is a 15-hour flight, similar in stature to Singapore Airlines and THAI Airways’ 17-hour nonstops to New York from Singapore and Bangkok, respectively. The plane, painted a light powdery green that matched Toronto’s weather quite effectively, was comfortable enough with on-demand video and two meal and two snack services. Another inch or two of leg room would be nice, but I was determined not to sleep so that I would be able to sleep once I arrived in Khrungthep. Fifteen hours provided me with plenty of time to kill. Despite the surprisingly limited selection of movies, I caught up on several including Denzel Washington’s psychological thriller Deja Vu and Aardman Animation’s (creators of the Wallace and Gromit series) Flushed Away. There was also an electrical outlet in the seatback, so I was able to get about six hours of work done. An internet connection would have been even better but, c’mon, what should I expect? In the old days you got a movie on the main screen (well, still current days on United as some other carriers) and these days you can have on-demand audio and video. 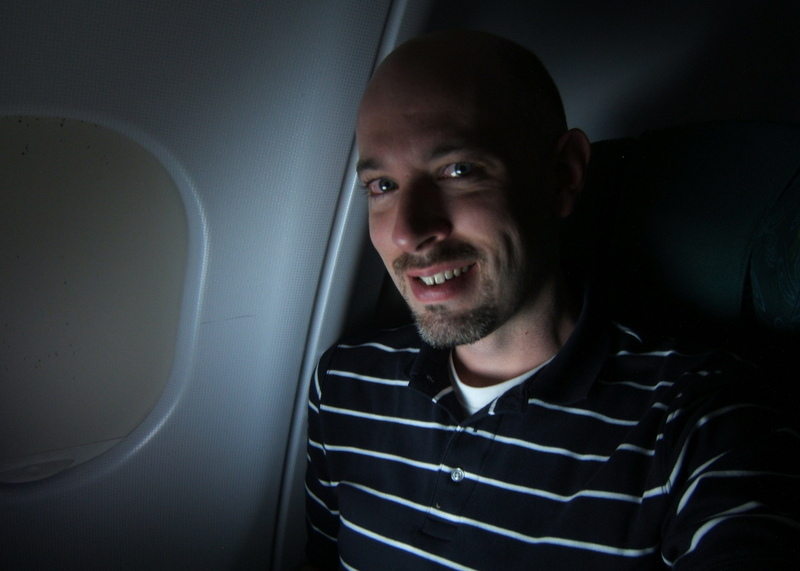 Here’s a funny self-portrait taken by the light of my laptop somewhere over the north pole. We arrived in Hong Kong at 3:00 in the afternoon, Tuesday. Such an efficient airport! We were through immigration in a hurry on aboard the Airport Express for a 24-minute ride to Central Station on Hong Kong Island. There we met up with Tehlin, a university classmate of mine, and her 3-year old son Samuel and 3-month old daughter Isabel. Tehlin’s husband Chris was able to join us a bit later. It was very nice to visit with them but I totally forgot to give her a Thai silk place setting that I had specifically brought with me on the trip because I knew I’d be seeing her! It went almost 20,000 miles only to be forgotten as we left the Pret a Manger shop at the IFC mall. Oh, well. Guess we’ll have to go back to Hong Kong soon. Not a bad idea since Allan and Valerie are in Guangzhou from Montreal to study Mandarin. 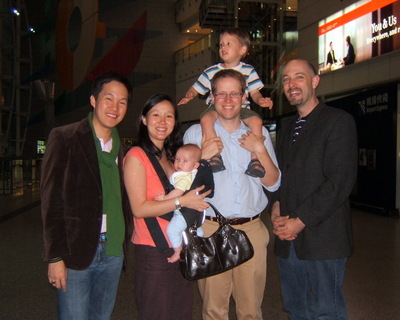 Since they’ll be there until June, maybe a trip back to Hong Kong is in the works. Now I’m back home. Tawn, unfortunately, had to head off to Beijing on business with his boss. Call time for the taxi: 6:30. Poor thing, he’ll be exhausted tonight. The trip to the United States has surely been a whirlwind: visiting friends and running errands, all day, every day. This afternoon (Friday), Tawn and I finally decided we had had enough of the errand running and have decided that anything that is on our list, unfinished, will remain so. No hair dye for that certain someone in Khrungthep who asked us to get it. In order to maximize our trip, which was award travel through United Airlines Mileage Plus program, I created a routing that included extended layovers in Tokyo, Toronto and Hong Kong in addition to our planned stops in San Francisco and Kansas City. It makes for a somewhat tiring pace, but if I’m going to stop in a city where there is someone or something to see, I’d rather take the time and get out of the airport. Leg One: Eight Hours in Narita, Japan – We arrived at Suvarnabumi Airport several hours early to find an incredible mess at the THAI Airways check-in counters. A line extended from the check-in area between aisles H and J, all the way back to aisle B. There were no customer service agents helping the line and the scene was rife with confusion. I saw a small sign that indicated that Japan and Korea flights could check in at aisle B so while I waited in line, Tawn went to confirm that sign. Our overnight flight aboard THAI Airways from Khrungthep to Tokyo was smooth. The flight is only five and a half hours long and after an hour delay from our 1:00 am departure as well as the two additional time zones we headed to the east, we enjoyed only about three hours of darkness before the sun rose. After arriving at about 9:00, passing through immigration and customs, we checked our carry-on bags at a left-luggage locker and took the train into the nearby town of Narita, for which the airport is named. Narita is about 90 minutes by train from Tokyo, but only one stop from the airport. 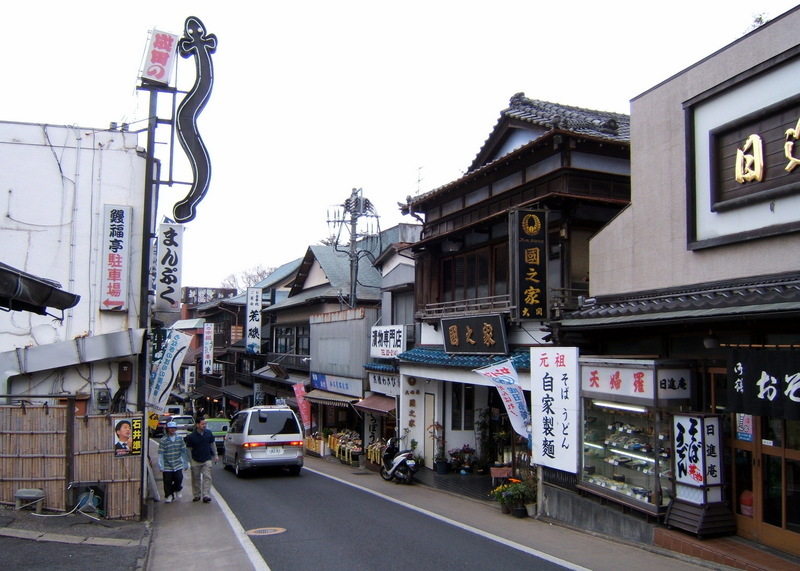 A small down with a compact center located on a series of small hills, Narita is famous for its barbecue eel and a temple that dates back to around 700 A.D.
Here’s a picture of the main street of Narita, leading from the two train stations to the temple. Notice the neon sign on the upper left – an eel! Below that, Tawn and I in a little restaurant eating anticipating the eel that has just arrived. Below that, two chefs prepare the skewered eels, alternating time on the grill with dips in the teriyaki sauce. Finally, a detail shot of the eel itself! We arrived back at Narita Airport several hours before flight time. Basically, if you have 4 hours between flights, you could clear immigration, go to Narita, eat your eel, and be back in time to board. If you have more than 4 hours, you’ll be in even better shape. Try it, you’ll love it. Despite having lost my 100K status with United after a year of minimal flying, we still were given lounge access, so we went to the brand-new ANA Airlines lounge, had some ramen, and showered in their ultra-modern shower facilities. Afterwards, Tawn did some airplane yoga poses with the model of ANA’s new Boeing 787 Dreamliner, below. Our trip into San Francisco on United Airlines was smooth, tempered with some lackluster (and occasionally downright unprofessional) service. Enough so that Tawn and I are largely ready to leave UA behind and find a new carrier to fly. Below, Tawn tries to get some sleep. We arrived Saturday morning a bit before 11. The trip through immigration was surprisingly hassle-free and our bags arrived pretty quickly. We had a brief wait as Anita was heading back over to the airport from an appointment in the East Bay. After she picked us up, we stopped by her house to unload our bags then ran some errands in the afternoon. Most importantly we went to eat fish tacos in the Mission District. We can’t get good Mexican food in Khrungthep. Below, Tawn and Anita with a bottle of champagne bought at Costco. Tawn and Chris enjoy tacos pescados at Taqueria Pancho Villa on 16th Street. Saturday evening Paul drove us over to my aunt and uncle’s house for a St. Patrick’s Day dinner. The entire family was there including all the cousins and their respective girlfriends, boyfriends and fiancees. In addition, we had a small number of friends with us. It would have been nice to expand the guest list, but I didn’t want to over-step my aunt’s gracious hospitality with an even larger number of guests. Sunday morning Tawn and I were up early and went to the Ferry Building to have breakfast at Boulette’s Larder, a self-described mise en place for your kitchen. In addition to being a little restaurant, they prepare stocks, soups, and other things that would largely serve as ingredients in a meal you’d prepare at home. On Sunday morning they serve beignets, light, fluffy and totally non-greasy. Last time I was here a year ago, it was Chinese five-spice. Today is was sweet garam masala, an Indian spice. Really good eats. I’m actually buying an oil thermometer on this trip with the express purpose of learning to make perfect beignets. After lunch we spent a little bit of time walking around the Ferry Building, which is glorious after its remodel. Below: Tawn in one of the shops at the Ferry Building; Tawn with the beignets; Chris with the coffee; the interior of the Ferry Building on a sunny Sunday morning. Sunday afternoon Anita drove us down to Lilian’s house in Sunnyvale and we had lunch with my High School friends. 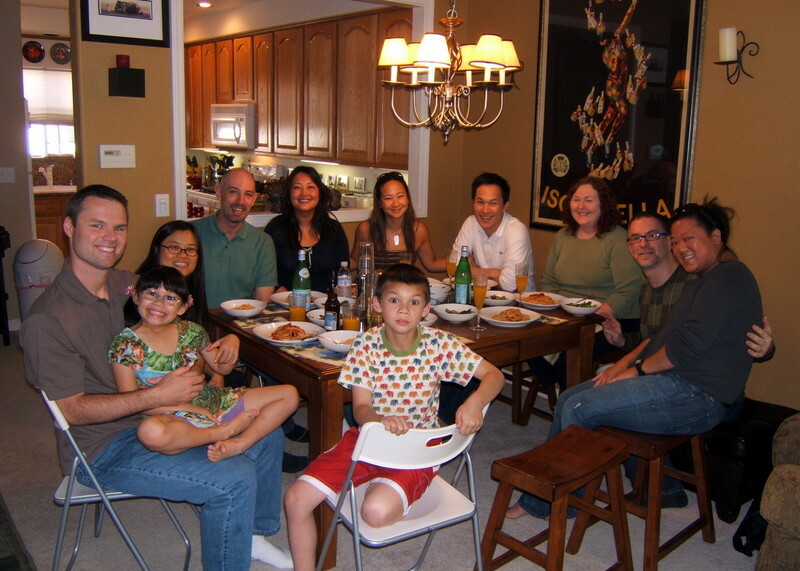 This is the group of friends I’ve known longest – Brad, on the left in the picture below, and I have known each other since 3-year-old preschool. It is always fantastic to see these friends as we’ve known each other so long and so well. Hard to believe that Brad’s children are both older than he and I were when we met. 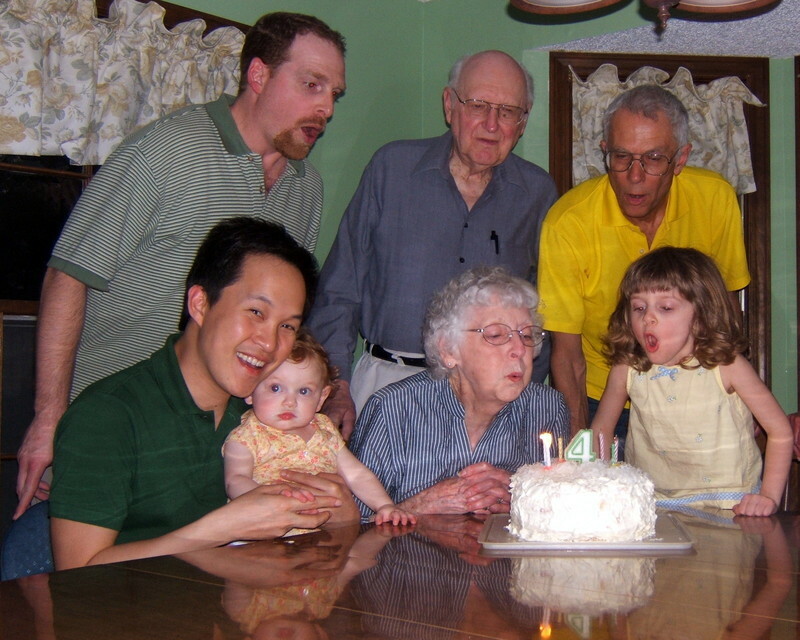 Above: Albert and Chris share some cake; Albert, Anita, Samantha and Tawn in the kitchen. Below, Cara in the center of all the activity. Finally, Sunday evening we had an “open house” at Sweet Inspirations dessert shop for a few hours. Many friends stopped by including JC, Chris, Jackson, Dave and Monty, Howard and his mother-in-law Eleanor, Andrew and Amy, and Tony. Additionally, we met for the first time a new reader of the blog, Jeff, who hosts a queer and questioning youth literary magazine/website called www.oasismag.com. We were sorry that some other friends were unable to make it, but quite thankful to spend some time with those who did. Monday afternoon we went over to visit Brad and Anne Marie, their daughter Sydney and their newborn, Harper. It is always such a pleasure to see them and for a four-year-old, Sydney is tremendously sharp. To the right, she and I practice writing her name in Thai, which she seemed quite fascinated about. They were in Thailand two years ago and Sydney still has some very clear memories of that trip. She is now advocating a return vacation there to visit Tawn and me. Brad and Anne Marie have conducted an extensive remodel of their backyard. In an attempt to cover all the elements, it has not only earth and wind, but also fire and water in the form of a fire pit and a water fall. There is a play area under the deck that includes padded playground covering, swings, climbing ropes, and other fun playthings. Below: You can see Tawn and Sydney playing on the swings on the upper terrace in this picture taken from the lower terrace by the fire pit. Below, Tawn and Sydney fight over who gets to sit in the pretty pink chair next to the lawn. We split our time Monday afternoon, Tawn to Union Square (where he bought only one thing, a pair of jeans) and I to the 1000 Van Ness Theatre to visit the San Francisco International Asian American Film Festival. It sounds like things have been running okay there but they have had some teething difficulties moving into two new venues, since the Kabuki theatre is undergoing renovations as part of its new ownership by Sundance Cinemas. I had a 17-minute visit with festival director Chi-Hui as we drove from the theatre to a meeting he had near the Castro. But a worthwhile 17 minutes, I must say. In the evening, Tawn and I had one final social engagement: meeting Jordan and his partner Wilford. Jordan was introduced to me by another Xanga blogger, Tony, during last year’s SFIAAFF. In the intervening year, he has been crowned Mr. GAPA (click on the link marked “Runway” at the top of the page) so now I know two famous GAPA people including Miss GAPA (Max Lau) from some ten or so years ago. Anyhow, Tawn and I met up with Jordan and Wilford at Cha Cha Cha on Haight, a Cuban restaurant that is probably number one on my list of restaurants I miss. It was a fun evening, getting to know them better and completing the circle of introductions. Tawn and I have talked in the past about how much we really enjoy knowing a wide mix of people. 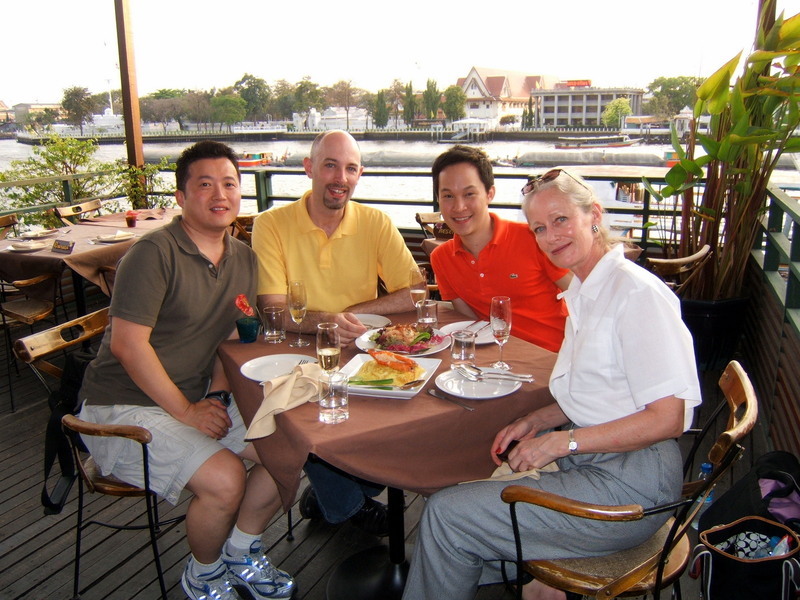 While we greatly value the friendships we’ve made with other Thai-American couples our age, we also like to know people of different age groups, different cultural backgrounds, and of course a mixture of gay, straight, bisexual, married, dating and single people. It makes for so much richer an experience. 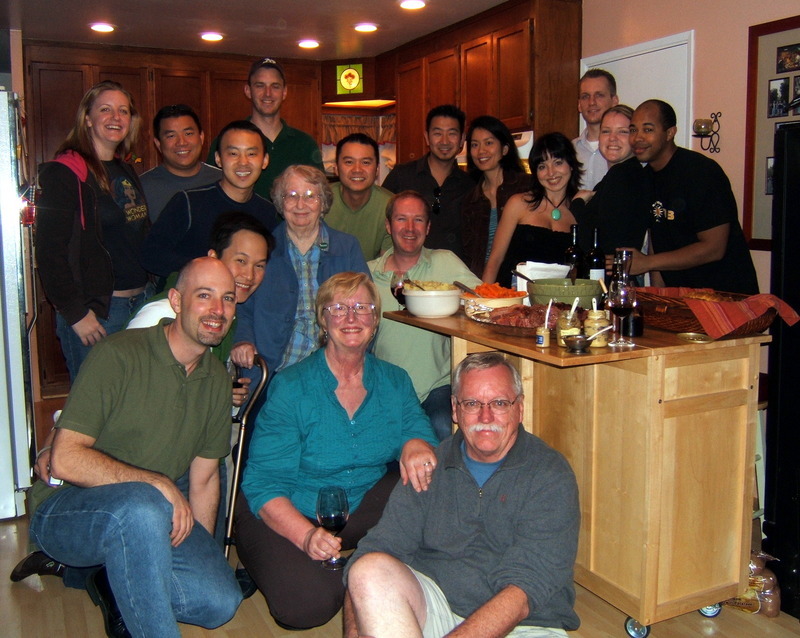 Making it an even more diverse experience: Wilford recently left the Air Force! That’s not an experience we run into with gay men every day, but proof that it really does take all sorts to protect and defend the country. Don’t ask, don’t tell? Puhleeze. I asked. He told. We left way too early on Tuesday morning to fly to Kansas City. This early departure was more than compensated for when we were greeted at the airport by my nieces, Emily and Ava. Emily’s fourth birthday is next week and we’re in KC for an early celebration of it. Ava just celebrated her first birthday and is remarkably mobile for someone so young. Right: Ava and Emily welcome Tawn at the Kansas City International Airport. We also visited Wednesday evening with Jak, a Thai graduate of KU who has been here for several years now. Having dessert on the Country Club Plaza we also met for the first time his boyfriend, John, who as coincidence would have it was in the Marines up to about four years ago. Yes, two military men in the past week. What are the odds? Perhaps higher than we realize. Above: Tawn and Chris read Emily a bedtime story. Below: My mother (“Grammy”) reads Emily an afternoon book while relaxing on the family room sofa. Emily really is getting a lot of literary exposure. As I mentioned, this trip has been all about errands. We’ve had a list two dozen places long. The most critical are complete and the least critical will probably not happen. Oh well. I should mention that not all these items were purchases. They also included things like going to the county election commission office to apply for a permanent absentee voter ballot, since I am no longer officially a resident of Johnson County, Kansas. I do still get to participate in all elections at the County, State and Federal level, but not in local city elections. Also, I headed to the automobile club to renew my international drivers license in case the Thai police need anything to use as collateral next time they pull me over! Right, Tawn considers how to pack all the things we’ve purchased, which should just fill the space taken by all the gifts we brought with us from Thailand. Tomorrow, Saturday, we have a combined birthday party for Emily and my grandmother. Then Sunday morning we’re off to Toronto and Hong Kong. First, mysterious black birds – foreigners! 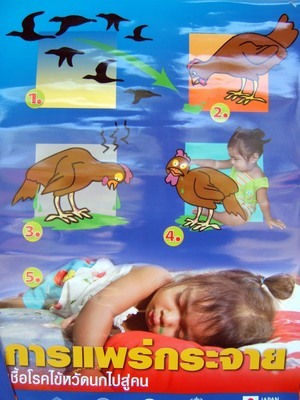 – poop infected poop from the sky. Then, our innocent local chickens eat the foreign bird poop. Our chickens get sick and poop and vomit green stuff. Then our children play with the chickens and catch the green stuff, too. 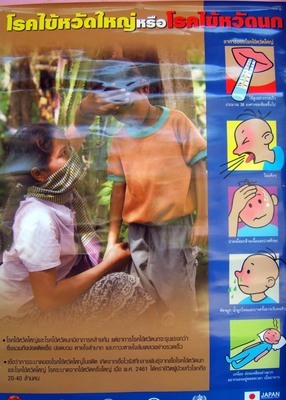 First, little sister is sick and sneezes onto her hand. Then she holds hands with her brother so he gets her germs. He doesn’t wash his hand before eating food so he gets sick, too. Then he throws up or sneezes and his baby brother plays with the vomit/mucus and eats it. So the baby gets sick and coughs on mom. Mom gets sick and blows her nose with the dish towel, then dries a cup with it. 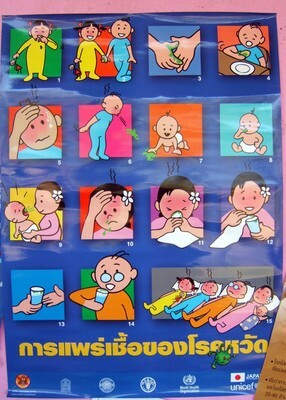 Dad drinks from the dirty cup and gets sick, too. Et voila, you have an entire family down with the flu. Friends, don’t let this happen to you! 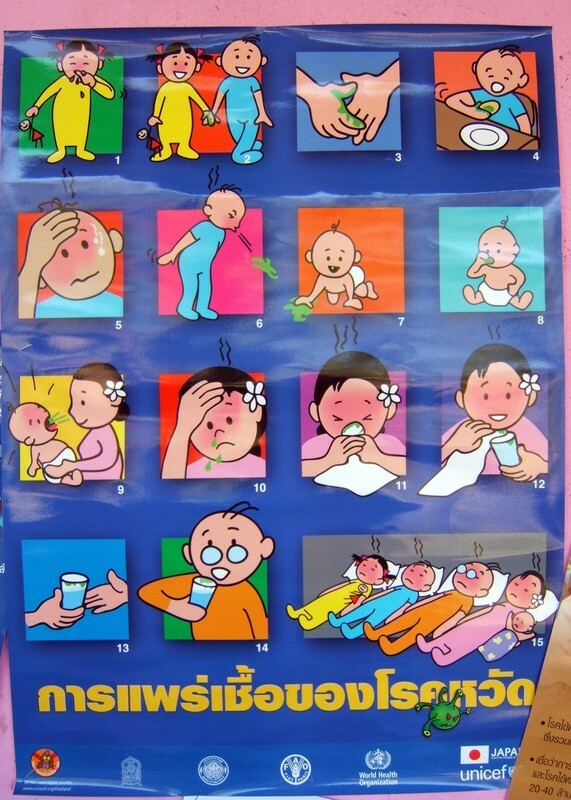 Follow the steps in the upper left and lower right posters! Last July the new Suvarnabhumi International Airport opened about 30 km east of Khrungthep. 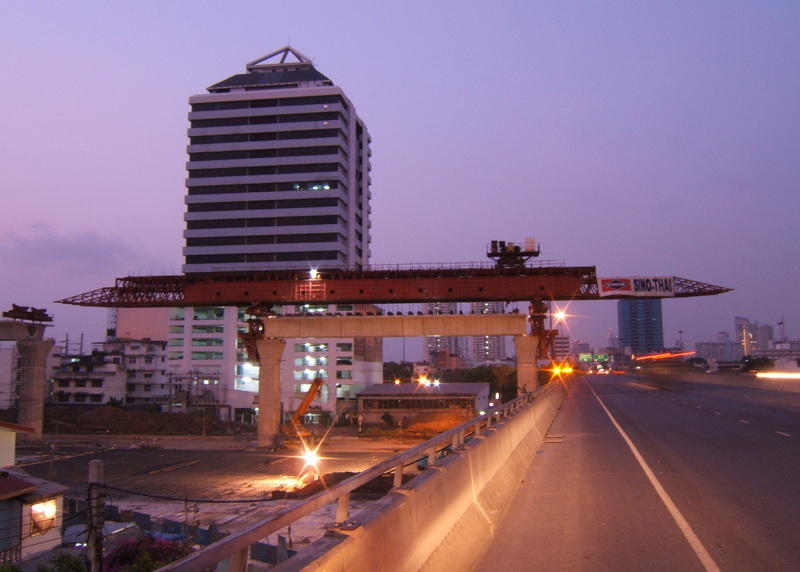 The Bangkok Metropolitan Authority anticipates that the high-speed rail line from the city center to the airport will be open sometime in mid to late 2008. No surprise there. The train’s path pretty much parallels an existing rail line that runs along Petchaburi Road. There will be a large inner-city terminal just a long block away from us, where Asoke and Petchaburi meet. This should be equivalent to Hong Kong’s Airport Express station that allows people to check in for their flight right in the heart of Central. They can even check their luggage there and it is transported securely to the airport and processed just as if they had actually checked in at the airport. The airport line will connect with the subway at that station, and then will continue west to meet up with the Skytrain at Phayathai station, near Victory Monument. The airport line will be an express train, promising 15 minutes from the city to the airport. There will also be a local service operating along the same line, and the Soi Soonvijai station will be built very close to Tawn’s parents’ house, about a 3-minute drive or a 10-minute walk away. Over the past six months as we’ve driven to and from the in-law’s house, we’ve seen piles being driven, pillars being poured, and other work being done. But the area immediately around the Ekkamai Road flyover (which crosses the train tracks and a canal) hasn’t had any work done. A few days ago Tawn reported that the construction had finally reached the flyover. Knowing that the flyover will never look the same again, I wanted to get some pictures. Before heading down to school on Wednesday morning I drove over to Ekkamai, parked on the shoulder in pre-sunrise traffic, and took some pictures. They aren’t perfect, but at least they document the changes. The construction process is fascinating. There are about twelve individual hollow concrete sections between that are combined to form the viaduct between each pillar. This enormous crane-like structure extends out from already-built section of the track and hoists new concrete sections into place. How they are fastened together, I’m not sure, although I see that there is some re-bar that connects the sections. Anyhow, it should be really nice for Tawn’s parents. They live far enough off the main road that they shouldn’t be inconvenienced by the new station or any noise, but close enough to benefit from increased property value. And of course, I’m just excited because I love civil infrastructure projects like this! What an urban planning geek I am. I shave, nearly every day. And that’s just my face. On top of it, every two weeks or so I shave my head. That’s a lot of shaving and the search for a quality shaving foam has been a tough one. There was a Nivea shaving cream that I used to buy in Hong Kong, but the company no longer sells it in Asia, only in the Middle East. I even emailed them to ask if I could buy a case of it directly from the company. They did respond – points for them – but said that it was only available from retailers. 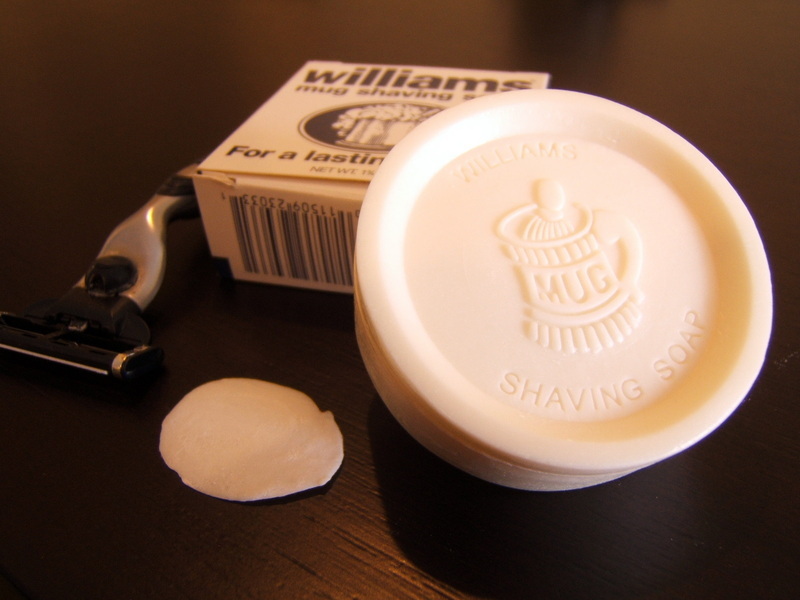 But last year while I was in Kansas City, I bought a cake of Williams Mug Shaving Soap. Their slogan: “For a lasting lather.” And I was super-impressed. Not only with the quality of the lather and the fact it stays wet for a good length of time, but also with how long the cake of soap lasted. I bought the soap at the end of last March and have been using the same cake – near daily – since then. In the picture, you can see the remnants of the cake on the left. Yes, it lasted a whole year! And this from a cake of soap that is 2mm thick with a 6 mm diameter (0.8 x 2.4 inches). Better yet, the soap cost me only 79 cents! Now, that’s real value. Have Class Photos EVER Taken so Long? How many times have you read in this blog that school is over for the year? I think I’ve said it multiple times and yet it doesn’t quite seem to end. This morning Tod and I drove down to Bangkhonthiinai. Ajarn Yai told me that there would be no class today, which I took to mean that the teachers had an in-service day or something. She told me last week that she was ordering some yellow polo shirts for me to bring to my family and they would be ready today for me to pick up. NEWSFLASH: The ubiquitous yellow shirts celebrating His Majesty’s 60th Anniversary on the Throne are, literally, so last year. This year we celebrate the King’s 80th birthday, so we have yellow shirts with an all-new, specially designed crest on them to commemorate the event. Get yours now! Tod and I arrived with the expectation that there would be no school, so also had the expectation that there would be no students. But there was school and there were students. Thankfully, though, there wasn’t any English language instruction since I hadn’t prepared a lesson! Instead, the task of the day – literally, the sole task – was to take a group photo of the ten sixth graders and their teachers. 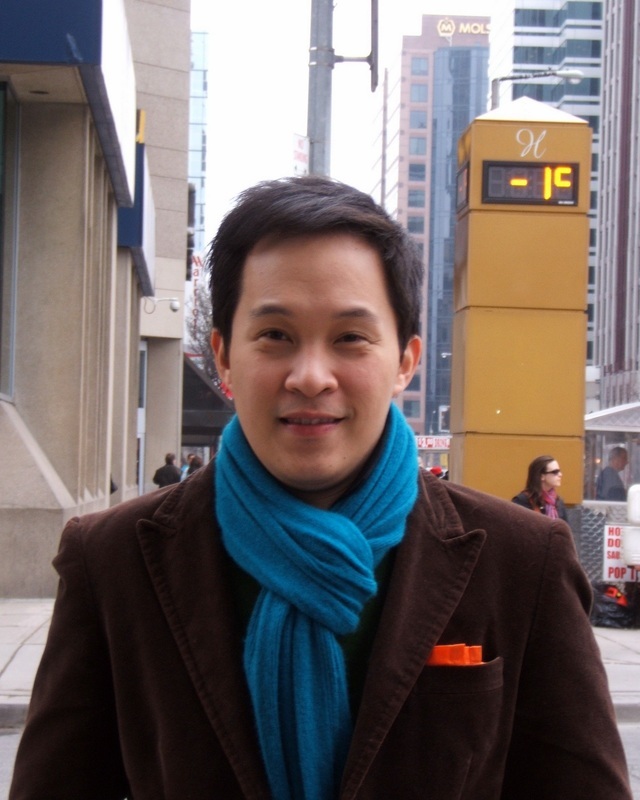 Ajarn Yai is one fussy person! 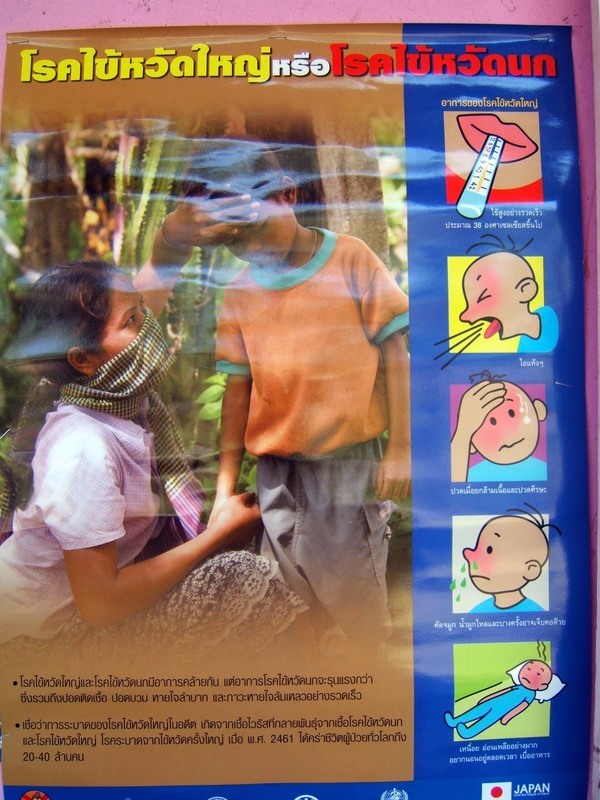 We took a whole series of pictures outside in the playground but upon inspection, Ajarn Yai pronounced them not acceptable. So we took another series on the steps where I first posed for a picture with the students last July, when I stumbled across the school on a bicycle ride. Those worked out a bit better. See below. Since I’ll be in the US next week, I thought it would be nice to mail my sixth graders congratulations cards from there. I doubt any of them have ever received a letter from abroad. Many of them have possibly never received a letter, period. It took each student a good five minutes to write out their address and they wrote it in very formal Thai. For example, before writing the address they wrote “Address House Number” before writing the address. They wrote “Amphoe” before writing the name of the amphoe or district they live in. They wrote “Zip Code” before the postal code. Etcetera. Here’s a more casual picture of just the students. From left to right, back row first: Ploy, Sorasak, Gornuwat, Piyachat, Chairat. Front row: Wanwisa B., Metta, Tamolwan, Wanwisa W., and Pagawan. After all of the retakes, Tod and I decided to stay for lunch since Ajarn Yai insisted they had already prepared extra food for us. Now, for real, school is over. Tune in again in late May to see the new school year get started. But of course, keep reading because there’s plenty more going on here in the meantime! Taking a few days of holiday after her week working in Southeast Asia, Tawn and I volunteered to take Christine (see previous entry) to the Grand Palace, Reclining Buddha, and Temple of Dawn. We also invited our new friend Brian, who had not yet made the temple circuit, figuring rightly that he would round out the party nicely. We met Christine at her hotel, the JW Marriott on Sukhumvit, with Brian arriving a few minutes before us. From there a quick taxi took us to the pier at the Taksin Bridge. For you history buffs, note that the Taksin Bridge is not named after the deposed Prime Minister Thaksin Shinawatra. Instead, it is named after the King who was the sole member of the Thonburi Dynasty, which immediately preceeded the current Chakri Dynasty. Taksin was king while the Kingdom of Siam had its capital across the river in Thonburi for about fifteen years between the sacking of Ayutthaya by the Burmese and the founding of Khrungthep. By not starting our tour until after lunch, we took advantage of lighter crowds and increasing cloud cover and breezes. It was still a warm day, but more pleasant than if we had been at the palace as soon as it opened. Sadly, the main hall of the Grand Palace, the one in which the Emerald Buddha is housed, is undergoing exterior refurbishment, so it is covered in green siding which you can see in the picture above. Thankfully, though, we could get inside and pay our respects. 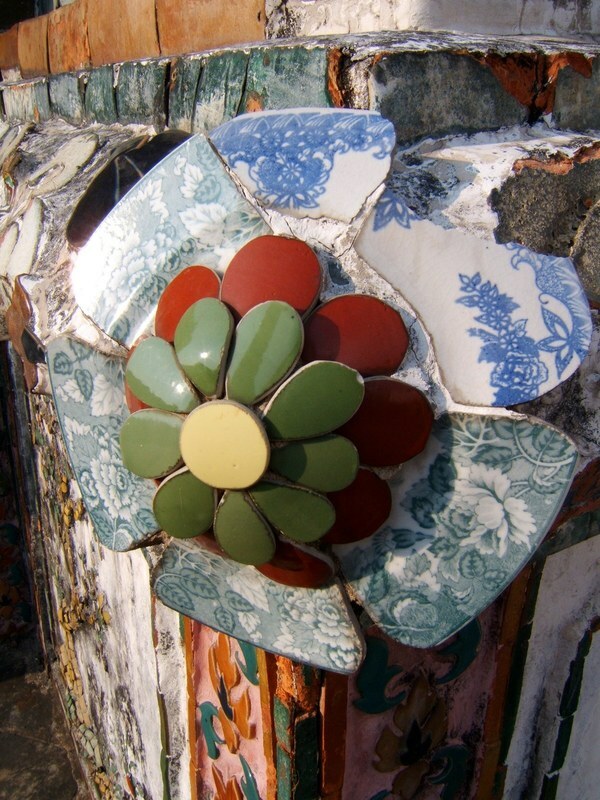 Left: detail of the porcelain used on Wat Arun. These are in fact broken plates. Many of the temples were decorated using porcelain that was brought as ballast in trading ships from China, and this often included brick-and-concrete statues and “one-offs” and mistakes in plate and bowls production that these days would instead be sold at a discount outlet! After also visiting the Recling Buddha at Wat Pho and then taking the 3-baht ferry across the Chao Phraya River to see Wat Arun, the Temple of Dawn, we arrived at The Deck. This small restaurant across from Wat Arun provides spectacular views of the river and the temple as it is lit up against the sunset sky. 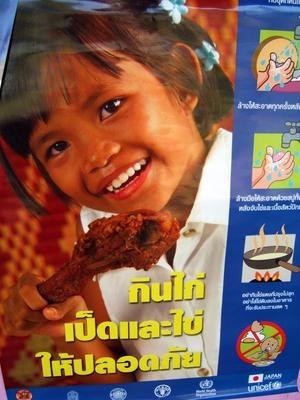 The food is both French style and Thai, and we mixed and matched to form an entire meal. In this picture below, we have Brian on the left, myself, Tawn and then Christine. The combination of personalities worked so well, and we enjoyed a liesurely dinner with conversation and a pair of bottles of sparkling French wine. On the way back to home after dropping Christine and Brian off at their respective residences, I mentioned to Tawn that Christine reminds me of no one so much as Katherine Hepburn. From her graceful, erect posture, to her no-nonsense trousers and confident demeanor, she could easily fill the role. This actually makes for a nice follow up to the International Woman’s Day entry from a few days ago. Because it is refreshing anytime we meet women who are not only successful in the business and academic worlds but are also very confident of their opinions and right to have a place in the world. My observation over the years is that often times, men (by which I mean straight men; gay men love them) often feel very uncomfotable with these types of women, labelling them with epithets to hide their own insecurities and feelings of vulnerability.